Have you ever wondered what a back-end developer, or designer, or data scientist actually does all day? Our new day in the life series seeks to answer just that question. We started by profiling Andy Zack, our Data Scientist. 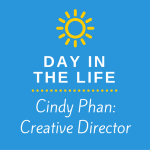 This time around, we chatted with Cindy Phan, our Creative Director. Cindy also told us that she aims to send one Corgi gif per day via email, so we thought it was only fitting to add some relevant Corgi gifs to her day in the life. 7:30 am: I wake up and go for a run or work out for 30 minutes. This is a really important way for me to wake up my body and clear my head before going into work. It gives me time to think about what to do during the day, how I’m feeling–it’s just good “me” time. 9:30 am: I get to the office (we work out of the NextSpace Hallidie Plaza coworking office), and we have our daily check-in. During our check-in, everyone says what they’re going to be working on that day. It usually takes about ten minutes. I eat breakfast during our check-in, too–usually fruit, or fruit with yogurt. I’m known around NextSpace for alway having fruit! 12:00 pm: I take a break for lunch–usually a salad that I bring from home. 1:00 pm: I like to do proposal writing from 1-2pm because I feel like it’s a good time for writing. I’m feeling focused, and I’m not feeling antsy or sleepy. So I spend this time replying to proposals or writing a proposal for a potential project. That means thinking through what the client wants, and what the best approach and timeline are for getting them what they need in the simplest way possible. We usually do three tiers of proposed approaches: one that’s basic, one that’s more interactive, and one that’s very interactive or highly engaging. Then clients can kind of choose their own Goldilocks approach. 2:00 pm: More fruit! Then I switch to doing wireframing and designing for another NARAL project. That entails thinking about what pieces of information the clients want to share, or what they want users to do, and then figuring out the best way to lay that out—either by pulling in current design, or using a new design for separate campaigns. 4:00 pm: I have a brainstorming session with Jim (our CEO) to see if there’s anything missing from my proposal approach, and if there’s anything else that should be included in the project’s scope. 4:30 pm: I leave the office when I feel like I’m no longer productive, and need a break to get my brain running again. 5:00 pm: I get home, go grocery shopping, and make dinner. I’ll do a little more design/dev work in the evening. 11:00 pm: I go to bed, and get ready to start my day all over again! Curious about the creative tech work we do? Think it might be a good fit for your organization? Shoot Cindy an email at [email protected], and she can give you a rundown of how we could work with you!